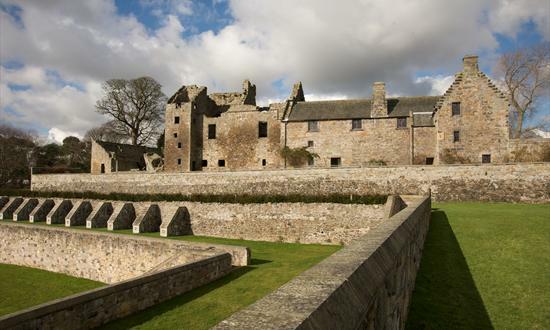 Built by the Douglas family, the 13th century fortified residence of Aberdour Castle was extended in the 15th, 16th and 17th centuries. See the large and imposing suite of buildings from the 12th to the 17th century with the grand hall-house, thought to be the oldest standing stone castle in Scotland. There is also a delightful walled garden, with scented flowers and a beehive-shaped doocot, which overlooks the Forth. Take a guided tour in summer to see all around the castle including the painted ceiling in the east range, which is a precious survival from the early 17th century. Access is limited to part of the ground floor which includes a tearoom, the walled garden and the upper terrace to the south of the castle. Upper floors and terraces are not suitable for visitors using wheelchairs or with limited mobility as access is by a set of turnpike stairs. Gravel paths to the gardens/grounds can be difficult for visitors using wheelchairs, however access is possible with assistance and for more mobile visitors. Toilets and disabled toilets are available.